In our last blog post we talked about the process of transfecting insect cells with virus DNA and how you could recognise success or otherwise. Transfections are normally done on a fairly modest scale (2-5ml) in culture dishes. Therefore your P0 virus stock is of low volume and probably modest infectious titre (107 plaque forming units [pfu] per ml or lower; we will discuss how to measure this value in our next blog). To produce a virus stock with a higher infectious titre and a larger volume you will need to amplify it further in bigger cultures of insect cells – usually Sf9. [It is worth mentioning at this point that although Trichoplusia ni cells are often used for producing recombinant protein we never use them to make virus stocks. This is because the infectious titres of these stocks are always very low (106 – 107 pfu/ml). Virus propagated in these cells is also prone to mutations in a key virus gene (FP-25) required for high level protein expression. We might return to this point in a later blog]. But back to using Sf9 cells. You can either inoculate monolayer or suspension cultures of these cells to produce a P1 stock. The scale of amplification you choose really depends on how much virus you need. Most often, we use suspension cultures of Sf9 cells ranging in volume between 25 – 200ml. The optimal cell density of these cultures is between 1 – 2 x 106 cells/ml. 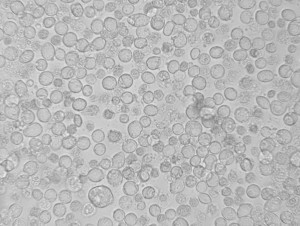 (See our cell culture manual for how to produce these cells). Once you have these cultures prepared you simply add some of your P0 virus stock and continue incubation with shaking for 5 days at 28°C. A knotty question that we are often asked is how much of the P0 virus stock to add to the cell culture. Now in the distant past when our CEO was learning the arcane arts of baculovirology the answer would have been that you first have to determine the infectious titre of your P0 stock using a plaque assay. Then you would calculate how much virus to add to your cell culture for a multiplicity of infection of 0.1 pfu/cell. However, in the modern era it is much faster to use QPCR (baculoQUANT all-in-one ) to determine the titre of the P0 virus stock. The procedure can be completed in less than a day. Of course, not everyone is able to do QPCR, so a good rule of thumb is to add 0.5ml P0 virus stock per 50 ml Sf9 suspension cell culture. This will introduce virus at a low moi while conserving valuable P0 stocks. Essentially, when you inoculate Sf9 cells as described above, you are looking to infect about 10% of the cells in the culture. The other 90% of cells continue to divide and provide a resource for the virus progeny that is produced in the first round of virus replication. The total incubation time of 5 days allows for infection of all of the cells and the production of a virus stock with the highest possible infectious titre. How do I recognize a virus-infected suspension culture? For some reason, it is always harder to spot the early stages of virus-infection in a suspension culture of insect cells. To help you determine if things are going well we suggest that after you inoculate the suspension culture that you remove 2-3 mls of cells and put them in a 25cm2 flask or similar sized culture dish with extra medium for a total volume of 5ml for monolayer (static) culture and continue the incubation at 28°C. (You can also include a control flask containing uninfected cells if you are new to propagating virus stocks). These cells will attach and you can then monitor the progression of virus infection on a daily basis. While the kinetics of virus production won’t be quite the same in monolayer and suspension culture, the former will give you a good idea of what is going on in the latter. After day 3 of incubating the suspension culture it is also worth removing a small volume (1ml) of cells to check their condition. In comparison with uninfected cells you should see signs of virus infection. If you count the cells you should also note that they haven’t increased in number very much. Virus infection arrests cell division so this is a good indicator that the amplification is progressing well. By 5 days post infection, your suspension cell culture should be well infected with virus and have attained its maximum productivity. Another sample of cells withdrawn and examined in a culture dish should look something like the example below. Figure 1. Recombinant baculovirus-infected cells taken from a culture 5 days post infection. Note the shrivelled appearance of many cells. Others appear to remain largely intact – this is quite normal. The most common problem when amplifying virus stocks is that the P0 stock has a very low infectious titre and so doesn’t initiate virus infection in the suspension cell culture. This can be because the cells used in the original transfection were poor quality, too thick, too thin or because the transfection agent used was not working as it should. This is where titration of the P0 virus stock can be useful. This information allows you to use the correct amount of virus to inoculate your culture. If you add too little of the P0 virus stock then the cells in your culture will reach their maximum density before the virus has a chance to catch up and infect them. The result is a virus stock with a very low infectious titre. However, if you find that the P0 virus stock has an infectious titre so low that you don’t have enough virus to inoculate the cells to produce the P1 stock, don’t despair. Just set up a monolayer culture of Sf9 cells in a 25cm2 flask in an appropriate medium (e.g. 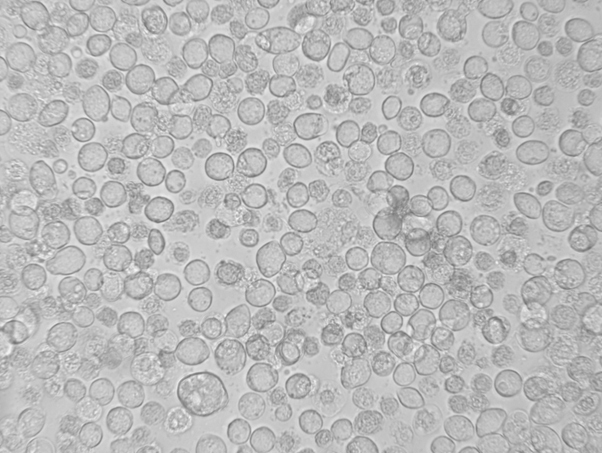 ESF 921) and after the cells have attached (about 1 hour required) add 100 – 300µl of the P0 stock. You don’t need to remove the medium first. Incubate this culture for a few days and look for signs of virus infection (see our previous blog for images of virus-infected cells). If you are unsure what to look for then set up a control flask of cells that you don’t inoculate with the P0 virus stock. If your virus inoculum was particularly low in titre, you may need to leave the virus-infected flask for a week to see the virus infection. The virus can then be harvested from the flask and used to inoculate the larger suspension culture of cells as described above. What do I do if my virus-infected cell cultures become contaminated with bacteria or fungi? If this happens within a couple of days of setting up the virus infection you may need to discard the cultures and start again. However, if the initial microbial contamination was very low your virus-infected cells may stagger through to the end of the 5 day incubation and produce a reasonable virus yield. In this case, harvest the cells and medium, sediment the cells and other unwanted microbial guests using low speed centrifugation and then filter the medium through a 0.2 or 0.45µM disposable cassette. This will provide you with a virus stock free of microbial contamination. In our next blog we will talk about virus storage and titration of the stock prior to using it to produce recombinant protein in insect cells. In the meantime, contact us if you have any problems with baculovirus-insect cell expression of recombinant proteins.